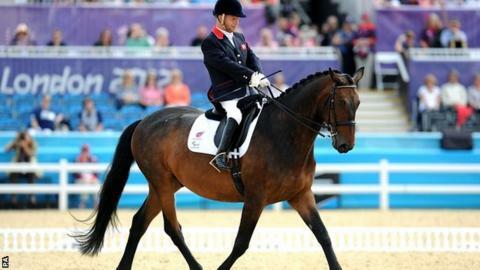 Britain's Lee Pearson suffered his first ever Paralympic dressage defeat and missed out on a 10th gold medal with silver in the Individual 1b test. The 38-year-old from Staffordshire, riding Gentleman, led with five riders remaining but was overhauled by Joann Formosa of Australia on Worldwide PB. Pearson has two more chances in London to close in on the 11 golds of Baroness Tanni Grey-Thompson and Dave Roberts. "I'm very, very proud of this silver medal," he told BBC Radio 5 live. "I know that I rode my best like I've done in my previous nine gold medals." Pearson is well placed for team event gold on Sunday, with the freestyle to follow on Monday. "I think the team's in a brilliant standing for possibly winning that gold," he added. "We have three more riders to go tomorrow though, and then Monday is totally different competition again, the freestyle to music, so watch this space." Pearson won three gold medals at each of Sydney 2000, Athens 2004 and Beijing 2008, but 51-year-old Formosa's score of 75.826% took her top of the leaderboard at Greenwich Park. The Australian held on for gold, with Pearson taking silver on 75.391% and Pepo Puch of Austria securing bronze. "I'm really pleased with silver, genuinely," Pearson insisted. "I've had a tough year, a tough month qualifying and then Gentleman a bit tough here, but I'm over the moon actually. "It's great for Joanna to win a gold medal but also great for the sport because now people will realise how difficult it is." Formosa was full of praise for Pearson, saying: "He's such a great ambassador and I feel very honoured just to be in the top 10 with him, but to beat him still hasn't hit home yet. "It felt amazing. I just went out there to have fun, I didn't have any plan."